Since I have been unemployed for the past couple of weeks, I have had a lot of time thinking about a lot a of different things. Like when I am going to find another job, who is going to be in the Final Four Men’s Basketball and where are those friends that I haven’t spoken to or seen for a long time? Since I have helped with all of our high school class reunions, Ainsworth High School – Class of 1985 (Flint, Michigan), I have enjoyed contacting people that I haven’t talked to since we graduated. Just the other day, I got an comment on the blog I have for our high school: AHS Class of 1985 Blog from someone that I haven’t even seen since our early years in high school. So that didn’t stop me from trying to find a friend that I worked with years ago. I have been wondering what happened to my friend, Jason, since we worked together about eight years ago. So I got online and “Googled” him. It took me a couple of tries, but I finally found him. I was trying to figure out how to contact him, then I found him on Linkedin. It was so nice getting back in touch with him. He is the type of guy who was a great friend and just fun to be around. I told him that I still have a picture from one of the company’s holiday party with him and other co-workers in it and it’s one of my favorite pictures. He told me he had a picture of us and another co-worker drinking a Shark’s Bowl drink at my birthday party. I thought that was so cool. After a couple of e-mails, we found out how small of a world it is… his girl lives in Texas (hey I live in Texas too)! He said he’s been down here a couple of times to visit her. I’m going to have to find out the next time he’s coming for a visit, maybe I will be able to see him after all of these years. So even though I have all this time on my hands, I managed to find an old friend that I have been thinking about. Hopefully we can keep in touch with each other and not let another eight years go by till we talk to each other again. So the moral of this story: if there is someone that you have been thinking about and haven’t seen or talked to in years, try to find them. Who knows where it will lead you? This picture was taken in 2006 on top of the Harbour Centre in Vancouver. I had the chance to travel there for a business trip. 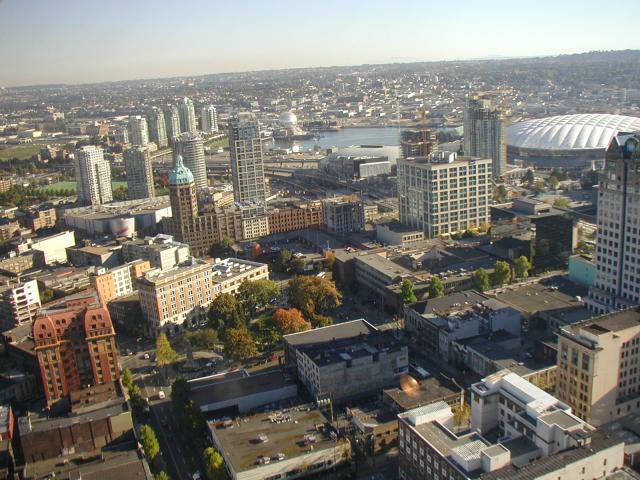 In the upper right corner of the picture, you can see the General Motors Place, home of the Vancouver Canucks and other events. Vancouver is a beautiful city and I enjoyed my visit there. Well, it was the first elimination on Dancing With the Stars. I was right on the Women’s side. But the Men’s side surprised me. Penn Teller and Kym Johnson were voted off. They were my next pick to be eliminated. It was a good show tonight. And if you liked the Jonas Brothers, you must of been in screaming at the TV screen. 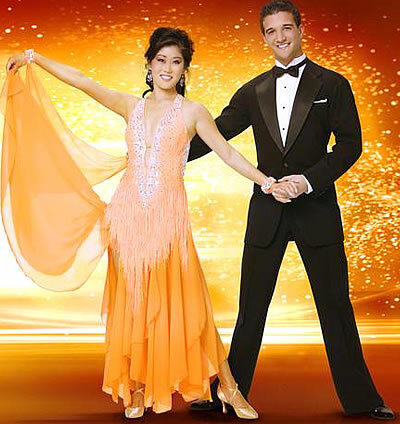 Kristi Yamaguchi and Mark Ballas – I like watching these two dance. It shouldn’t be long until they get their first “30”. Jason is nice to watch. Tall, dark and handsome! After the dances from last week, here are my picks of who is going to be eliminated this week. Johnny Sampier is the son of some very special friends, Dennis and Rebekah, that I have known for almost 10 years. Johnny has Autism. His parents have worked very hard to make Johnny’s life better. They even have a website about: Johnny’s Story (coming soon), About Autism, News on Autism, Fundraisers and How to Help. I wanted to share it with you all. Dennis and Rebekah are really special people that I am lucky to know! 1. Pray for the families of those affected by autism. 2. Participate in one of many fundraisers hosted to benefit children with autism. 3. Write to your state senators and representatives if you live in a state with little insurance coverage for autism. 4. As the costs for autism are staggering, you can donate to organizations or individuals who deal with autism. If you’d like to contribute specifically to Dennis and Rebekah as they battle to help Johnny, please click on the fundraisers tab to participate in one of the many events that raises funds for Johnny’s therapies. Thanks for your support! Every little bit helps in the fight against autism! Here was my favorite dance from Week 1 of Dancing With the Stars. Kristi Yamaguchi and Mark Ballas dancing the Foxtrot. After watching the men dance last night, I was looking forward to watching the women dance tonight. Like I said before, I think this is the season where the women are going to out shine the men. First of all, I almost fell out of my chair when Derek said he was a boy last year and this year he’s a man! I thought that was really funny for some reason. I think Shannon will do good, but she seemed too intense and looked like she could knock Derek out. I think the judges were right about Monica. She may be one of the first voted off. Too bad for Jonathan, I like him. She really seemed happy to be on the dance floor. I liked watching her and Tony dance. They were fun to watch. I think she did a great job. She needs to relax a little bit while she is dancing. She looked so serious. And what was up with her “speech” during the scoring? WOW – Kristi and Mark looked really good on the floor. I don’t think her being a ice skater before gives her an advantage in dancing. Hopefully my pick for this season will win. I think she did a great job. For being deaf, she really had a lot of rhythm and could move on the dance floor. So who did I like tonight? Kristi (of course) and Marlee. Overall, I think the women did a little better than the men. It should be a great season to watch and see who will win the glass ball trophy.